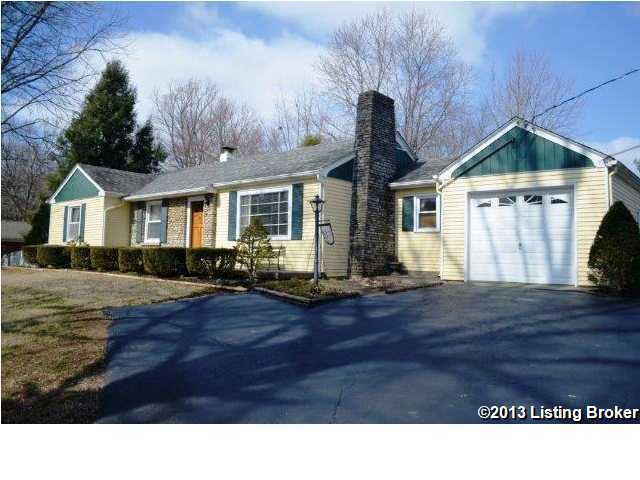 Fantastic 3 bedroom ranch on over an acre, off Ash Avenue! Hardwood flooring, eat in kitchen, family room with fireplace and a nice large formal dining area. You will also find an additional sun porch and family room on the rear of home. Outside you will find beautiful landscaping and a shed for your lawn equipment. This home has been well cared for. Won't Last! Seller is offering a 1 year home warranty. Call for your private showing today! Direction: Westport Road to left on LaGrange Road KY146 go approx. 1.2 miles and turn right on Ash Avenue, take the first right on Old Forest Road, house on right. Tuliphurst is a subdivision within the city of Pewee Valley, Kentucky. There are currently 1 Homes for Sale within Tuliphurst, with asking prices ranging from $357,000 to $357,000. The average list price per square foot of the available inventory in Tuliphurst is $115, which is below the Pewee Valley average of $171. Recent comparable homes have been selling for 97.54% of their asking price. Waterfront homes represent 100.00% of the available Tuliphurst inventory. The population of Pewee Valley, according to the 2010 Census, is 1,456. The total number of households in the zip code of Tuliphurst is 1,169, with an average household size for of 2.70 people. The total number of renter households within the zip code of 40056 is 124, which means that 89.39% of households in this zipcode are owner occupant households. 120 Old Forest Rd, Pewee Valley KY 40056 is a Home, with 3 bedrooms which is recently sold, it has 1,660 sqft, 0 sized lot, and 1 Car Garage,Attached,Driveway,Entry Front parking. A comparable Home, has 4 bedrooms and 2.5 baths, it was built in and is located at 100 Ash Ave Pewee Valley KY 40056 and for sale by its owner at $ 357,000. This home is located in the city of Pewee Valley , in zip code 40056, this Oldham County Home, it is in the TULIPHURST Subdivision, and THE RESERVE AT FOX RUN are nearby neighborhoods.